Can you believe it's almost November??? 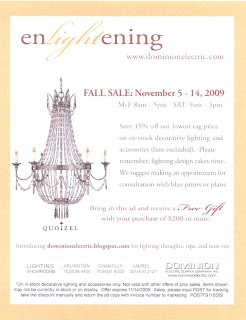 The good news is, that means it's almost time for our annual Veterans' Day Sale, so there are going to be some great deals at Dominion Electric Supply next month! The sale officially runs from November 5th through the 14th, but we're doing a "preview" for our special customers, so if you print out this post and bring it in, we'll give you the sale prices early. 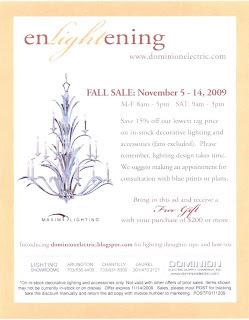 All in-stock decorative lighting and accessories (fans excluded) will be 15% off our lowest tag pricing. We have quite a few reduced, red-tag items in all 3 showrooms, and we even take the 15% off the sale price, so there are some fabulous deals to be had!